You are discussing the following picture with your English friend Jim. Now you are telling him how you understand the picture and what makes you think so. Hi, Jim, there is an interesting picture conveying a message vividly that a difference between reality and dream may as well be recognized in our life. Evidently, realizing this difference and trying to shorten this gap is the key to achieving our accomplishment, otherwise nothing will be gotten in the end. In our daily life, some people are aware of their ability, making great efforts to improve themselves, while others ignore the disparity between their earnest wish and poorest actuality, doing nothing but complaining. Conceivably, the confused man in the picture is exactly the latter one. In this picture, a man is fishing on a big stone, waiting and waiting. 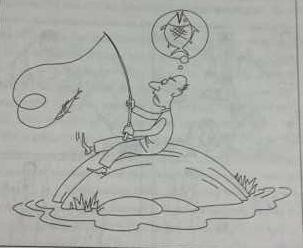 However, the small fish he has caught is totally different from the big one he is longing for. Now, there are two options in front of him: face the reality and keep trying till get the dreamy fish, or drop his fishing rod and feel desperate. Apparently, he chooses the second one. Such a situation seems fairly common in our society. We are faced with this kind of intriguing question all the time, and every choice we make has great influence on our way to success. Making an accurate estimate of our realities and dreams, then sparing no efforts to approach the tip is the only option for us to make, provided that we are in great want of achieving our goals. Based on the above statement, a conclusion will be arrived at that learning to accept the reality and adopting a positive attitude towards the dream is what we are supposed to do, when confronting our less-satisfying situation.